Today is a super special day, we’re so glad you’re joining us! 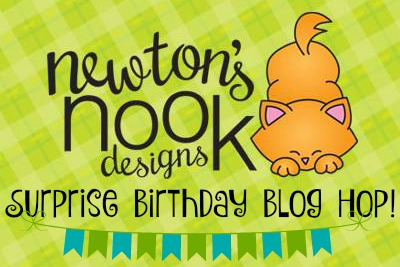 All of the Newton’s Nook Designs DT members have gotten together to throw a surprise birthday blog hop for Jennifer, the owner, illustrator and all around wonderful person behind Newton’s Nook! We are so honored to get to work with Jennifer, and we all just love her so much and wanted everyone to celebrate your birthday with you! We hope you have the happiest birthday ever! Make sure you scroll down to the bottom of this post to see the whole list and hop along and comment for a chance to win! 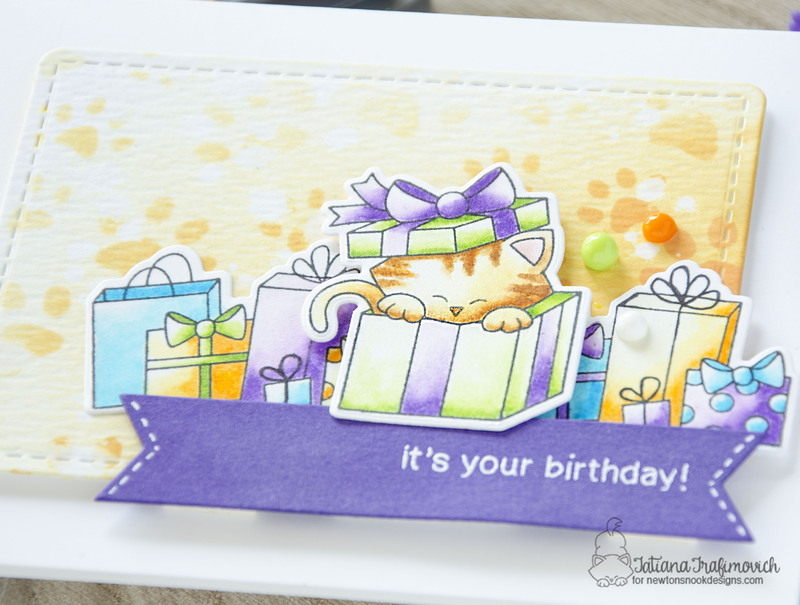 For my stop on this hop I created a sweet and colorful birthday card featuring my ever favorite kitty Newton! He is an adorable sweet orange tabby cat and the inspiration for NND name and logo. Today I used a non traditional for a birthday theme Newton’s Christmas Cuddles stamp set that has a few super adorable and versatile images so it was super easy to interpret it in a different way by simply changing the color palette! I obviously chose NND logo colors and colored the sweet kitty as Newton to give a personal touch to the card! I used my win win combo which consists of Zig Clean Colour Real Brush markers, Strathmore Bristol paper and a small water brush from Pentel. For the layout I used Frames & Flags die set and added a heat embossed sentiment from Newton’s Birthday Bash set. Finally a kitty paw pattern was added to the background through Pawprint stencil with Distress Oxide ink in Spiced Marmalade color and an ink blending tool! Comment on the NND blog and Design Team blogs (see list below) with a birthday message for Jennifer! The winner will be chosen at random from the collective posts. Make sure to check out each of their blogs and comment for your chance to win. You will not know which blog has been chosen so the more you comment on the better your chances are of winning! You have until Sunday, February 18th 9pm EST to comment — winners will be announced on the blog post on Monday, February 19th. Thanks so much for stopping by!!! Have a fantastic day!!! Happy Birthday to you, Jennifer ! I wish you a very joyful celebration of your day ! 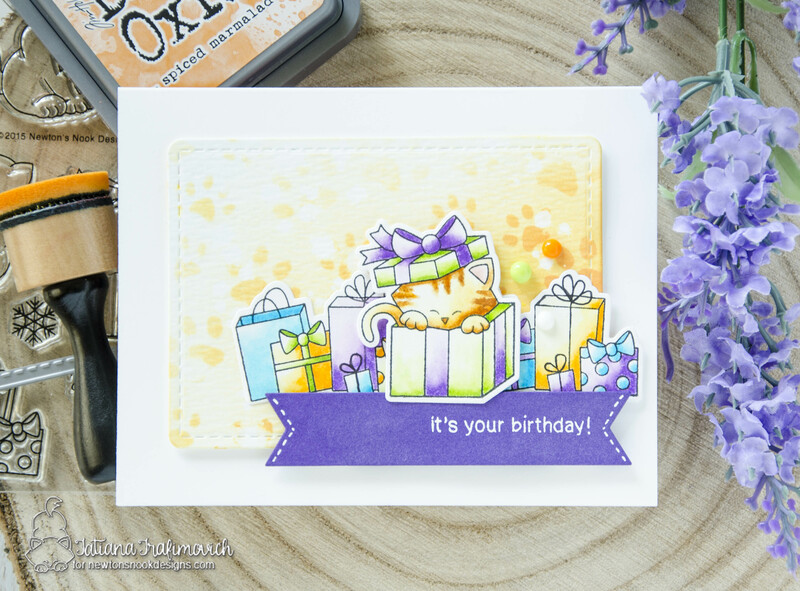 And now, to the blog hop…..
Beautiful coloring on this adorable card! 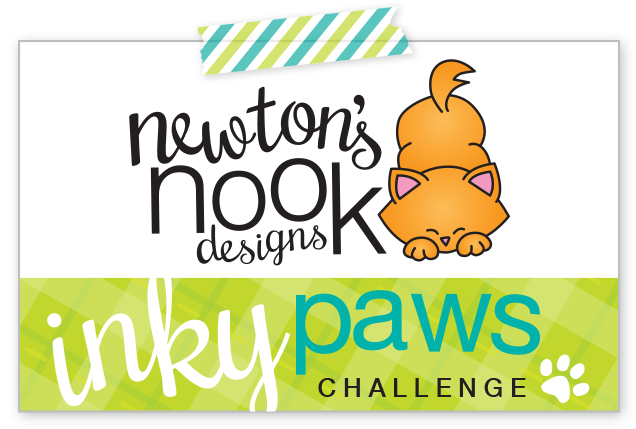 Love the way you colored Newton and the coloring of the background with the paw prints! Happy Birthday to Jennifer! That is just perfect..I need to start looking at my stamps differently. How fun you’ve turned this into a birthday image and your coloring is beautiful as always! Happy birthday Jen. Hope Newton spoils you!!!! 💞 Adorable soft card!!! I love seeing posts where stamp sets are repurposed! It helps me to think out of the box and stretch my stash! Thanks for sharing and happy birthday, Jennifer! What a beautiful card! I love the ombre coloring on the gifts and Newton is just so cute peeking out of the box. this is so adorable card! So many presents, only one day to celebrate. Oh my, what a great card with presents and a cute kitty! Love it. Happy Birthday Jennifer enjoy your party. LOVE your color choices and all the wonderful presents. Terrific birthday card! Love that pile of pretty colored presents with Newton peeking out. Like the paws on your background and all the purple! Hope your birthday is full of surprises, Jennifer! What better gift than an adorable little kitty in a box?! Love the color combo on this card 😊. Happy Birthday Jennifer – hope you are having a great day! Too too cute!!! Love that background, and who could resist that sweet image. LOVE this!! Hi! Have you already checked that you’ve been chosen a winner for this hop. 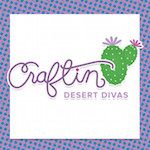 Please contact samanthamann11(at)yahoo(dot)com for a coupon code! Thanks so much for entering the giveaway! Wonderful card – love it! Happy Birthday Jennifer!! Ah look, Jennifer is getting a new kitty for her birthday! Your card is gorgeous! Love your colouring and gorgeous colour combo! Wishing Jen much happiness on her special day! She’s one of the sweetest people around! And very talented! Happy Birthday, Jennifer. I hope this turns out to be one of your very best yrs yet! Such a fun card – your coloring is really amazing – I’m really surprised to read you did that coloring with Zig markers! Fantastic job. I also really love the orange background piece – and I”m not even a fan of orange! LOL Wonderful card, I cannot help but smile looking at all the details! Oh this is darling! Love the pawprint background and the fun colors together! Great birthday card. Super coloring as always. Happy b-day Jen! So cute with the paw print background and all of the presents. I love love love your card, the colors are awesome and your coloring is even better!! What a fun card. Gotta get the paw print stencil. Love Newton! 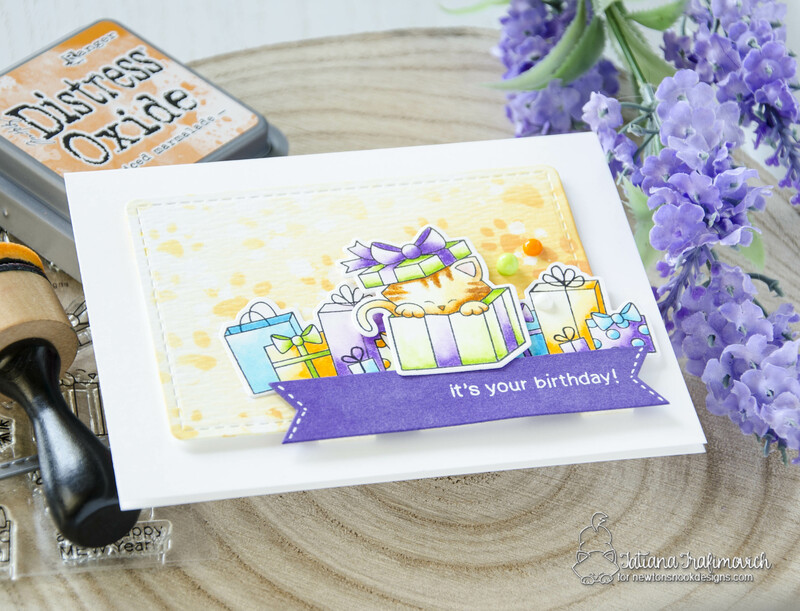 Love the color combos on this card and love the fact that you used the stamp set! It is one of my favorites for birthday cards! Happy birthday Jennifer! Oh my, I love the softness of the colors you used to color your card. I love that you used the NND logo colors and the way its colored. SURPRISE Jennifer, have a wonderful day!!! This is such a wonderful card, so cute ! Fabulous card! I love all the wonderful layers! Hello Tatiana! This card is so sweet! I love that you colored the kitty like Newton! Thank you so much for helping to make my day special! you girls are the best!